E como a água é importante não só para nadar mas também para hidratar, algo indispensável nas mais longas provas de águas abertas e durante os treinos de natação, vamos ter as exclusivas garrafas arena. E se os nadadores do arena Elite Tema as vão receber com nome e bandeira, também tu podes encomendar uma igual - mas com o teu nome e país! June 9 here we go again, proudly representing arena water instinct at Setubal Fina Marathon World Series 2018. This is one of the foremost 10K open water swims in the world, elected as the Olympic Qualifier event for London 2012 and Rio 2016. Among other top swimsuits and swim gear we'll be there with the arena carbon triwetsuit, one of the few FINA approved wetsuits* and arguably the best. Water is the begining, essential to swim but also to hydrate. 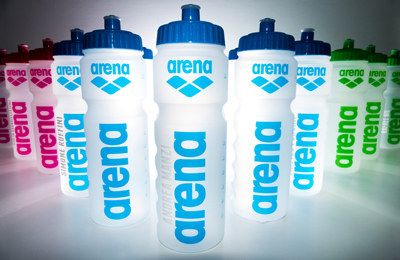 And so we managed to make availalble free arena water bottles for the 10K swimmers racing in this event. Just go to our stand and ask for yours along with a courtesy photo. * With the 2017 open water swimming rule changes, compliant/approved wetsuits became: mandatory for water temperatures bellow 18º C, allowed for water temperatures bellow 20º.